Got a BIG digging job? We can do it! Got a SMALL digging job? We can do that, too! 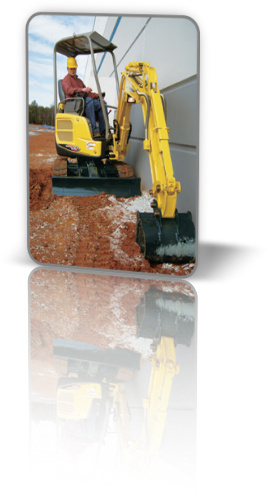 Our mini-excavator features rubberized track (easy on your lawn), and at just 37 inches wide (less than a meter) we can get it through narrow spaces and openings (like between houses and through gates, etc.) that many other excavators can't get through. We can dig that patio base quickly so you’re ready to go, or dig around your foundation when you have water leaking into your basement. Our mini-excavator is perfect for any digging job where space is tight and you don’t want to risk damage to your home, your fences, your landscape, or your neighbor's property. Rent it by the hour (minimum charge applies), or by the day. Or e-mail us for details.